We recently spent a couple of very enjoyable nights at the Pottsville North Holiday Park. This is a great family spot to stay with a swimming pool and children’s play equipment, but look elsewhere if you want an absolute beach front camp site. We chose the Pottsville North Holiday Park over the Pottsville South Holiday Park because the park has children’s play equipment and a pool. The Pottsville South Holiday Park should still be considered if you have children because it has a very nice playground nearby, as well as a child-friendly beach. 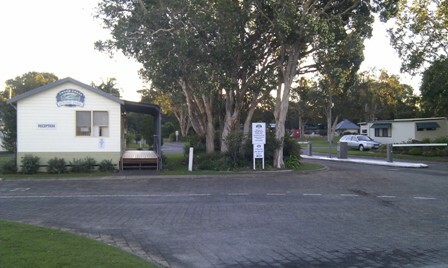 The Pottsville South Holiday Park is smaller and was packed to capacity the weekend that we visited. Pottsville North Holiday Park is significantly larger and there was plenty of space for everyone. The north holiday park can obviously get busy at some times of the year because the camping site were well used with bare ground where tents had been set up. 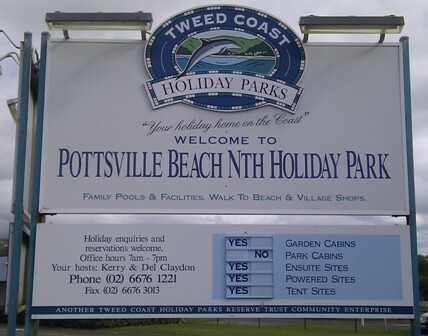 Pottsville North Holiday Park is a short walk to the beach — however, this may change in future years because the walking track is through a vacant block of land that is currently for sale. If a house is built on the land, park guests will need to walk around the corner to access a designated beach access point — it is just not as direct. Pottsville North Holiday Park seems to have one half for permanent sites, while the other half was for tourist sites and holiday accommodation. As tourists, we were encouraged not to drive through the permanent sites to get to our site at the back of the holiday park. 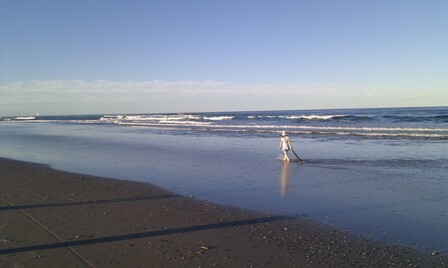 Our site was large and was on fairly hard packed sand. 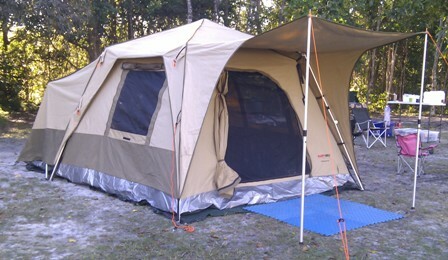 I used normal tent pegs (not sand pegs) and did not have a problem with them pulling out. At the time that we were there, the pool was being renovated with a new lining. This would be a very nice area for the kids to have a swim in the summer with the play equipment adjacent. The amentities block was clean, although there was a problem with the sink and toilet plumbing on the first morning we were there. The park management quickly had this fixed though. Park management were friendly and helpful. We only saw them at check in and check out, and when buying a bag of ice. Cudgera Creek was right behind our camp site — this is not a creek that kids can swim in. Because of our proximity to the creek, we expected our site to be bad for mosiquotes. This was not the case, with mosquitoes only seen on the first night we were there. Mind you, we had mosquitoe coils burning the rest of the time. My daughter and wife who seem to attract mosquitoes, only got a couple of bites in the three days of our stay. There was a resident bush turkey who always seemed to turn up when there was food around. The bird came close, but did not make a nuisance of itself. Late one evening I also spotted a long-nosed nocturnal animal, possibly a bandicoot, scurrying around the camp site. Overall, Pottsville North Holiday Park is a pleasant place to spend a weekend or longer if you prefer to have a some space. 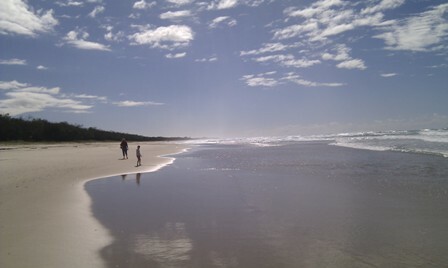 If you don’t mind being crowded and want to be right on the water, consider Pottsville South Holiday Park. Wow! You’ve outdone yourself. I’m loving and drooling over all of these! Thanks. Follow my Tasmania Road trip if you really want to drool. I am just getting around to writing the stories 12 months on and am just getting to the good parts. Follow the tag here.